When I created Host Unknown, I bought over the annual tradition of collaborating with Twist and Shout to produce an annual film to help spread cheer and security awareness throughout the land. Followed by the sequel that everyone said was an even better follow up than Terminator 2 was. Finally, I bought Thom and Andy into the inner circle and gave them supporting roles as two of the wise men in last years film. So, it was with some excitement I was glad that we got together again to shoot our 2014 Securi-stmas film. Instructions were simple enough to turn up to our location – but as the old saying goes in the movie business, never work with kids, animals, Thom or Andy. 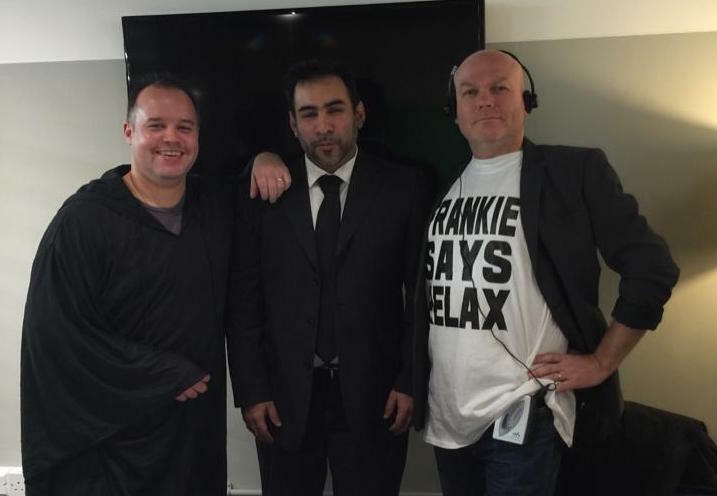 Thom had an 80’s party to get to and thought it would be alright if he just turned up in his retro gear, complete with ‘Frankie says relax” shirt and walkman, whereas Andy came in what appeared to be a bargain burka he picked up at the Black Friday sales. Needless to say, what was supposed to be an easy two hour shoot was still there four hours late mainly due to the inability of Andy ‘9 takes’ Agnes’ to remember three lines. My heartfelt sympathies go out to Richard who will be editing this one. Stay secure my friends, Jav. When I created Host Unknown, it became immediately apparent to me that in order to get the two novices of the team, Javvad and Andy, some better exposure and to practise their “skills” in front of the camera, such as they were, they needed to learn quite a few tricks from this old dog. My unique style and approach that I wanted to bring to HostUnknown was already getting recognised even in something as simple as my blog writing, winning the Best personal security Blog of 2013. This year I thought we could repeat the success of last years films. It was with some trepidation though that I organised the shoot, coordinated the script, paid for the director and cameraman and arranged for some serious actors to appear. After all, Javvad and Andy would need all the help they could to look good on film. I thought that even they couldn’t get simple costumes wrong, so I allowed them to arrange their own. I pulled out my best party clothes and looked, I have to say, rather suave and debonair throughout the shoot. Unfortunately I think Jav came straight from another court appearance and Andy from a Star Wars convention. I was disappointed once again, but really, what else could I expect from either of them. Will I never learn? We had scheduled three hours for the shoot, but with Jav and his cries of “line? LINE? LINE!” throughout the day, and Andy’s “takes to performances” ratio dramatically increasing again, we were there until very late, making me late to my club once again. I was able to speed things along by completing all of my shots in one take of course. I hope you like the film; I know the editor will have a very tough time with Javvad and Andy’s sections, but I understand much of what they say, and in fact do, can be covered up in post production. My thanks and apologies go to the real professionals in the shoot; I know we all did a sterling job in the face of true, amateur hour, adversity. When I first created Host Unknown, I had no idea what I was letting myself in for and to be honest, the rewards do not come anywhere near the charitable effort which I put into it. First up, fading Infosec “Rock Star” Javvad Malik; he comes with a heap of baggage you wouldn’t believe. The founder of Twist & Shout came to me begging to help him get rid of Javvad – or as he put “that guy who suffers from delusions of grandeur”. I’m someone who believes in fixing a problem rather than burying it and I asked how I could make the situation easier for Twist & Shout. Identifying my ever-charitable mood, T&S begged for me to be part of future productions in order to keep a close eye on the “deluded ego-maniac”. I explained that my hands were already tied after I committed to take elderly-statesman-breaking-into-security Langford under my wing. T&S were so desperate for my services, when I said the only way I could be on set with them was if Thom was hanging on my coat tails, they knew that my presence, regardless of how small, would immediately make up for poor performances from Malik. On that first day, I felt bad looking at Thom chewing crayons at the edge of the set that I declared the only way I could continue was if he had a speaking part too. And thus a new tradition was born. Directors and those in the know have affectionately referred to me as “The Water Carrier”. In the same mold as footballing greats Didier Deschamps and Claude Makalele have earned the same descriptor. I don’t know which characteristics of mine specifically people liken to the aforementioned legends but I would guess it was likely my high work-rate, tenacity, stamina, efficacy at lateral thinking while also being known for tactical intelligence, versatility, and leadership probably contributes to my understated reputation – But I very much prefer to remain in the background. A Christmas video this year nearly didn’t happen owing to short notice. Twist & Shout didn’t have faith in Javvad “Spoon feed me my lines” Malik and Thom “What year is it?” Langford being able to follow instructions but once I had taken responsibility for them, Jim was happy to proceed. We focused on getting the lines right for them and agreed that we could script my part on the day with no worries whatsoever about me being able to deliver. Thus what we have is the end result of me playing the part of 3 people (much like the running of Host Unknown). A special thanks to the pro’s at Twist & Shout who put up with Thom and Jav as a favour to me. I hope you like the fruits of our labour – be kind to the others when reviewing. This entry was posted in HostUnknown, Teaser and tagged Andrew Agnes, christmas film, Host Unknown, javvad malik, looking for sponsorship, Thom Langford, twist and shout by hostunknowntv. Bookmark the permalink.